This is actually new to me as I have just stumbled upon some news about this Xbox One feature after it has been known for a couple of months, it's called Xbox One upload studio. 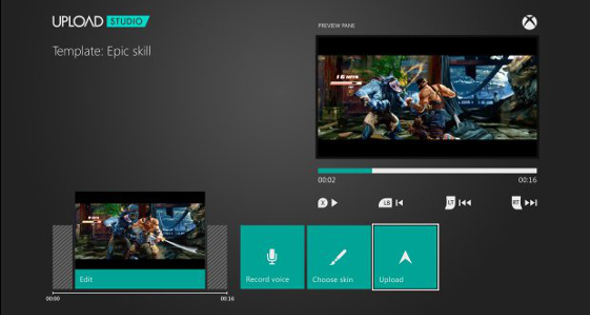 Xbox One upload studio is a tool that allows users to edit, theme and share videos they have recorded from their video games and present them on their own channel for other gamers to see. 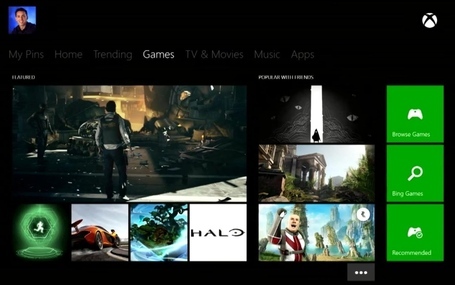 Each users channel will most likely be attached to and accessible from that users own Xbox One profile. If you had an amazing, funny or weird moment while playing a game you could record it and upload it to your channel for the Xbox community to see. "At EVO 2013, one fan went undefeated for hours in “Killer Instinct” until at long last the best player on the “Killer Instinct” development team was able to defeat them. Using Game DVR, they were able to record the best parts of the highly competitive set of three matches. With Upload Studio, they were able to quickly turn it into a stylized video clip that could be shown off locally, like during a panel at Comic-Con, or broadcast through Xbox Live for the world to see." "If you want to share gameplay footage immediately without editing it, Xbox One also supports that. Simply say “Xbox record” at any time and the console will record what happens next for you to send to your friends or upload to the Internet." Here is a video from IGN with Xbox's Creative Director Matt White giving a brief walkthrough on how it works. A few hidden games has appeared on the xbox dashboard, this brief article from polygon with go through them and try to see what these could be. 1. Bottom left green Crackdown agility orb, I don't know why they would use that unless we're getting a sequel (a real one this time). 2. Bottom right has the Rare logo, if its an HD realization of a old franchise I wouldn't know what it is. Today was the day microsoft finally revealed their new xbox, quite a few interesting things were revealed today with more on the way at E3 in just a matter of weeks. So lets go through some of the main things that was shown at todays presentation. Microsoft has revealed the name of the new xbox, Xbox One. Not a name that many of us were expecting hear for the new console, the reason for the name is for the "all in one experience" the new console will have, games, entertainment and TV. 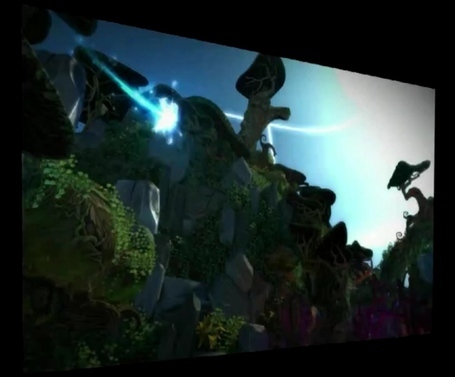 From the picture above we see the actual console itself, the new controller and the kinect camera/sensor. The new console design is not bad but they could have stayed away from the chunky straight edge look and more of a curvy smooth design, but it's still ok. The new controller hasn't changed too much from the 360 controller except for a few minor details, the over all shape and layout is the same but has an extension with a glossy finish that sits at the top of the main body where the bumper buttons and the xbox home button (now touch sensitive) are located, the thumbs sticks hasn't change much except for the grip around the edges. The kinect sensor has a bit of a different look this time. It has a flat front service with one camera lens, the movement sensor along the botton and it will be included with each Xbox one. The Xbox one will feature Skype, be able watch TV and a snap feature which allows the user to do more than one thing at a time e.g you can watch a movie and browse the web at the same time without closing down one application to access another. Microsoft confirmed that 15 titles will be exclusive only to xbox when the console is launched, we don't know what the titles are or who is developing them but no doubt E3 will shed light on that. Well they did show us a trailer of one of the Xbox One's exclusives, Quantum Break developed by Remedy. 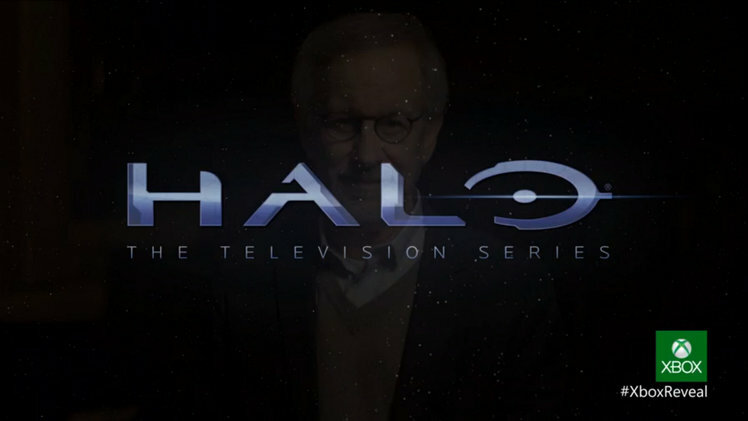 343 was briefly in the spotlight at the presentation but not to show of any video game related content, but to confirm a live action TV series and Steven Spielberg will be involved with it, but what role he will be playing is currently unknown. That's pretty much the main parts of the presentation, I will try and add a video of the full presentation for those have have not seen it yet. EA has confirmed that they will be scrapping online passes for all of their future titles due to negative feedback, so those who usually buy preowned games will not have to fork out extra cash in order to access their online features. The passes, which require a one-time activation to access online content, have been scrapped due to negative user feedback, according to EA senior director of corporate communications John Reseburg. "Yes we're discontinuing Online Pass," Reseburg told GamesBeat. "None of our new titles will include that feature." The passes have been controversial due to their restricting access to content for second-hand buyers. Once an Online Pass has been used, the second-hand user is required to purchase another pass before accessing the relevant content, which is usually the title's multiplayer features. But no longer. "Initially launched as an effort to package a full menu of online content and services, many players didn't respond to the format," Reseburg continued. "We've listened to the feedback and decided to do away with it moving forward." "We're still committed to creating content and services that enhance the game experience well beyond the day you first start playing." EA titles that have implemented the Online Pass include Battlefield 3 and SSX. Ubisoft and Sony have also used Online Passes for titles including Far Cry 3 and Starhawk. It was announced last month that EA's forthcoming shooter Fuse will not require an Online Pass to access multiplayer features. 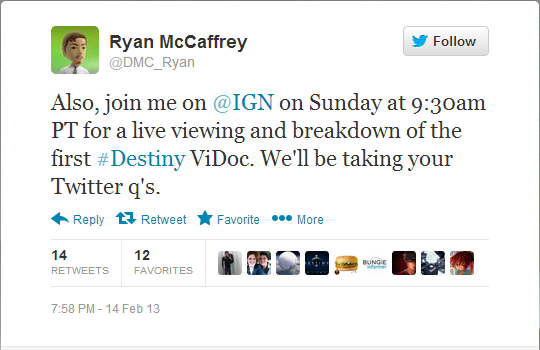 IGN's Ryan McCaffery posted on twitter that Destiny vidoc is coming our this sunday at 9:30 am PT. He will be providing a live viewing and breakdown of the vidoc. So as we basically have not see anything about destiny yet except the concept but do you have anything you would like to see, anything you would like bungie to go into detail about, campaign, story, multiplayer? Credit to Superintendent for find this news. 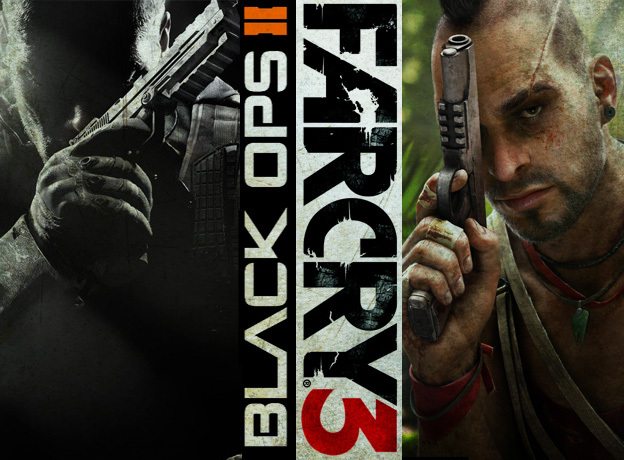 It's been reported that Black ops 2 and Far cry 3 were the best selling games in period of Dec 30th 2012 - Feb 2nd 2013. More details below. Credit to lil dog for this article. The NPD Group has revealed the top ten best-selling games in the United States for the month of January. Callahan said Far Cry 3’s ranking marks “the first time since January 2002 with Final Fantasy X that a December launch has ranked second in the following January.” He added that Ni No Kuni “was just outside of the top ten game ranking at eleventh” but would have ranked at #7 if sales of individual games weren’t combined into groups by platform. On the hardware front, Callahan notes “Xbox 360 led hardware sales again this month. This is the eighteenth consecutive month the platform led overall hardware sales and the twenty-fifth consecutive month it has led console hardware sales.” Microsoft said in a statement that 281,000 Xbox 360s were sold in the United States in January and that $338 million was spent on Xbox 360 games, consoles and accessories for the month. While Nintendo didn't provide specific sales figures this month, Gamasutra reports that "cumulative three-month Wii U sales are down 38% vs. Wii's first three months on the market." Sculpture of a Destiny alien creature? 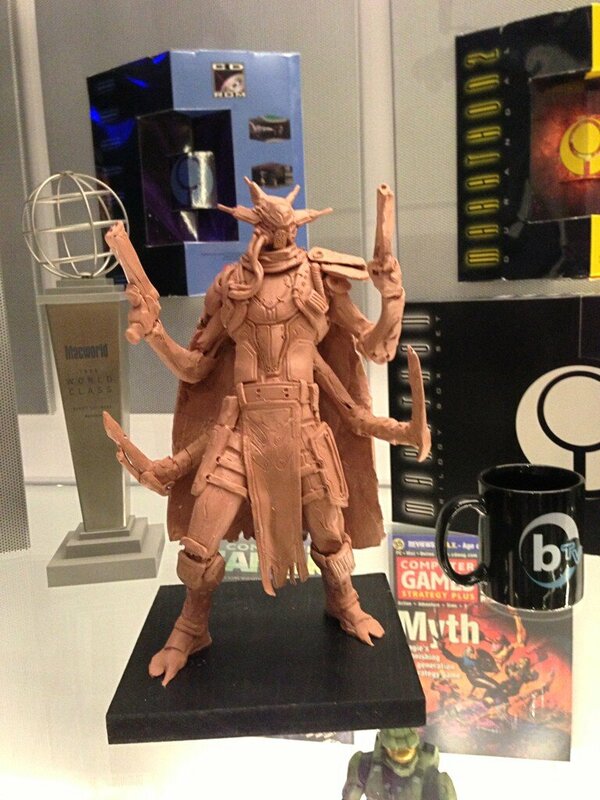 This picture was found on twitter and it's a sclupture of an alien character presumed to be from bungie next game Destiny. It looks similar to an alien character that was in the concept are for destiny. Bungie are revealing destiny this sunday so I'm sure we will find out if this creature is destiny related or not. So in the mean time what are your thoughts on this, do you think it's destiny related, do you like the look of it? It looks a bit similar to this character in the concept art below. 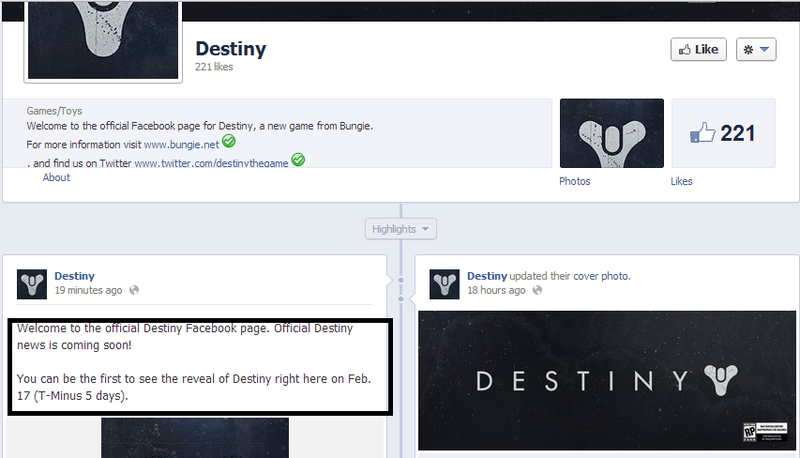 Destiny has been confirmed to be revealed on Feb 17th on the destiny's official facebook page. Nothing has been said what exactly we will see, there is also another destiny reveal coming in late march at the Game Developers Conference. This all that has been said about it so check back at the news section for more info on this reveal. Yesterday bungie tweeted that an ARG (alternate reality game) has begun for destiny and it begins at this site http://alphalupi.bungie.net/. 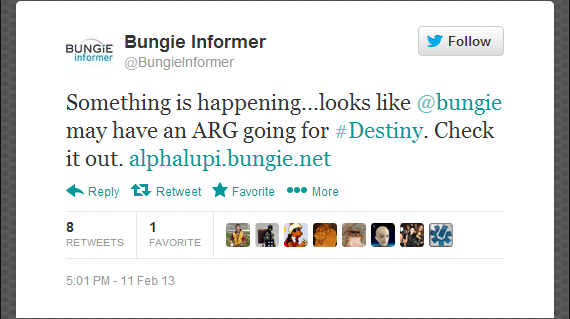 ARG's have been used for bungies games since Halo 2 back in 2004 which was I Love Bees (ILB) and IRIS for Halo 3. So for Destiny another one begins and once clicking on the linked site provided above a series of dots is presented which are geomantic symbols and you are required to align them up in a correct order and it will reveal a picture. You will be required to do this for each one on each day of this week. For anyone who has missed yesterdays (like myself) you can still go back and do that one. So if you are into this kind of thing then get cracking and solves the puzzles. With the next-generation of Xbox comes the chance that gamers will start to see less and less titles than they currently are, but some people still see the next-generation as a chance for smaller developers to get their games out to the masses. According to a report from GamesIndustry today, Double Fine's Tim Schafer did acknowledge that the next-generation of consoles could provide some challenges to smaller studios. "But we've talked to [the console manufacturers], and told people what things would be hard for teams our size with regards to consoles," Schafer said. Schafer went on to say if next-generation systems can open up something like what Steam currently offers, then it could something independent developers can work with. "We'd still like to be active in that space, we care about consoles, but unless they open things up a lot more like what we have on Steam... if they opened things up more it would be a more friendly place from our perspective. "We've talked to them about this stuff, and you know, they hear us. "They're big companies and they can't make changes overnight, but I think they're taking all of that stuff into consideration. We'll have to see what happens," Schafer said. Independent developers are crucial to the gaming industry as they can come up with some of the best and most original content. Xbox 720 needs to find a way to accommodate independent developers because if not, they will simply stay on Steam. It isn't like they have nowhere to go. Microsoft needs to work to acquire that sector of the industry because most gamers will be a bit disappointed if consoles get reduced to receiving only 15 or 20 titles a year, as a result of smaller and indie developers staying with Steam. Even with all of the features and upgrades the system is suppose to have, it will mean nothing if the only titles that hit the system are the same franchises that we see each year. Personally, "Assassin's Creed" is great, but "Journey" was amazing, and those types of games refresh a gamer's mind for what a game should be. With those experiences lost, things could get a bit boring. Gaming has so much more to offer and with the exception of PC gaming, people should be able to access and play all of it on one system. Wasn't that the original idea behind gaming consoles? Developers providing one place where people can experience all types of games? It has yet to be seen what Microsoft will do with Durango, but they must find a way to incorporate indie gaming, since it is such a significant portion of the industry. Would you as a gamer be fine with just 15-20 AAA titles per year on your next-generation console, with no other option? It's hard to imagine core gamers would have any interest in this happening. Next gen Xbox and Playstation graphics impact will not be as big as the 360 & PS3? It may be the case. In an interview with VideoGamer on Tuesday, Cevat Yerli provided some interesting commentary in regards to the graphics of the PS4 and Xbox 720 next-generation systems. The CEO of Crytek revealed that the studio did not believe that the upcoming consoles won’t have the same visual impact as when the PS3 and Xbox 360 first launched. You can check out some concept renders of the PS4 and Xbox 720, as well as some screens from the upcoming multiplatform title, “Crysis 3,”. "The current generation consoles, when they launched, were far ahead compared to PC. But PC has caught up. With current generation consoles and what's on the horizon – new ones – due to the fact that the cost of CPU and memory are so much more expensive than they were in the past, it is simply impossible to have the same kind of impact on the console business; to be so far ahead of PC." The PS4 and Xbox 720 consoles are expected by many to come out next year.